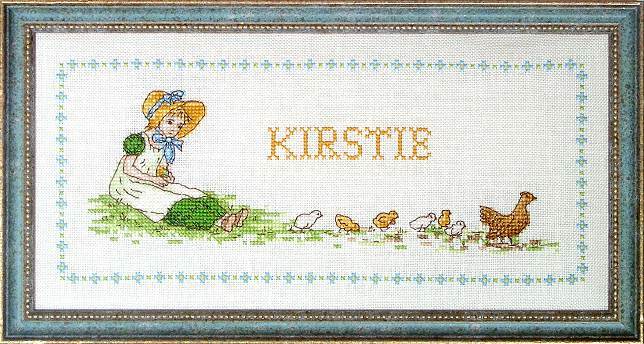 This counted cross stitch kit is based on 2 different illustrations by Kate Greenaway. The colours used are lovely and bright and would certainly appeal to any little girl. The design comes with two full alphabets of different sizes, together with numbers, to enable you to stitch the design with any name or even as a birth sampler. The individual motif of the little girl also makes a lovely picture framed on its own. The design is worked on 28 count Cashel linen and the worked area measures 11½ x 4½ins (27 x 11cm). The counted cross stitch kit contains threads (floss), fabric, needle, chart and instructions. Or try our pattern pack leaving you free to vary the fabric material, count or even colour. Kit contains Zweigart 28 count Cashel linen, Anchor stranded cotton, black and white symbol counted cross stitch chart, needle and instructions. Pattern Pack contains black and white symbol counted cross stitch chart, colour photograph and instructions.